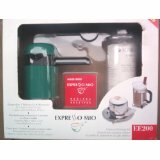 Black & Decker Espresso Maker Review. Takes a few trys to get the proper time needed on your microwave, but it is well worth it. Makes great espresso, and is very easy to operate.